On a recent trip to Washington, D.C., I had the good fortune to speak with several curators from the Smithsonian’s National Museum of American History. For a collectibles geek like myself, the experience was unparalleled, as I learned firsthand from the curators what they collect, why they collect, and what they hope to communicate to the floods of visitors who walk through their institution’s doors. In the coming months, we hope to publish in-depth interviews with many of these fine folks, as well as with their counterparts at the Smithsonian’s National Postal Museum. In the meantime, here are a few notes from my trip to the NMAH. 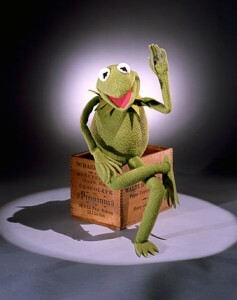 Kermit the Frog is a popular attraction at the Smithsonian's National Museum of American History. My day begins with a visit to the office of Dwight Blocker Bowers, who has the enviable job of overseeing the museum’s entertainment collection, which includes the ruby slippers worn by Judy Garland in The Wizard of Oz, the chairs that Carroll O’Connor and Jean Stapleton sat in during the 1970s run of All in the Family, and just about everyone’s favorite Muppet, Kermit the Frog. Bowers smiles as he looks up from the computer screen behind his desk. Today, among other things, he’s preparing interpretive materials to go along with a new donation to the collection—the Smithsonian, I was surprised to learn, has zero budget for acquisitions. It’s a costume designed by Bob Mackie and worn by Carol Burnett in her legendary “Went With the Wind” sketch, which aired on November 13, 1976. In that sidesplitting pinnacle of television comedy, Burnett and company parodied the scene from Gone With The Wind in which a determined Vivian Leigh sews a dress for herself out of a pair of curtains. In the 1939 classic, Leigh triumphantly descends a staircase wearing her gorgeous creation. For Burnett’s frock, Mackie sewed in a curtain rod across the shoulders and liberally trimmed the dress with drapery tassels. Hilarity ensued and TV history was made. For Bowers, the “Went With the Wind” dress is a perfect item for the Smithsonian because it cuts across so many interest areas, in this case television, costumes, Carol Burnett herself, and the source of the parody, David O. Selznick’s iconic movie. With room for just five percent of the Smithsonian’s holdings to be on view at any given time, curators like Bowers have to be able to make a strong case for the appeal of an object before they will accept it into the collection, let alone lobby for its presence on the museum’s floor. The Smithsonian, as Bowers likes to say, is in “the forever business,” so he doesn’t accept or seek additions to the collection lightly. These days, Bowers is on a mission to track down as many costumes as he can to showcase achievements in theater, film, and television. “Costumes bring things to life,” he says, adding that finding good costumes is not as easy as you’d think. While new material is readily available (the Smithsonian just received a Simba mask and Rafiki costume from the musical version of Disney’s The Lion King), costumes from older Broadway musicals are tougher to come by. For example, Bowers would love to get his hands on the cowboy skirt and vest worn by Ethel Merman, who he calls “as timeless as the Santa Fe Super Chief,” in Annie Get Your Gun from 1946. Trouble is, the costume no longer exists because back in those days costume shops routinely recycled the fabric in old costumes for new ones. 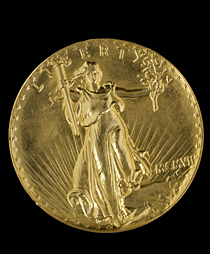 A gold Double Eagle pattern coin from 1907, just one of the 1.6-million objects in the Smithsonian's coin-and-currency collection. From Bowers’ office I am led to the Smithsonian’s high-security coin vault of 1.6-million objects, which doubles as the offices for the coin-and-currency-collections staff. I am greeted by Karen Lee, an exhibit specialist, and we are quickly joined by Richard Doty, who is the Smithsonian’s senior numismatics curator and the author of the definitive America’s Money, America’s Story: A Chronicle of American Numismatic History. For Doty, coins and currency are not just so many pieces of gold or scraps of paper. This is the history of the country that you are holding in your hands, and both Lee and Doty press rare coins into my palm to ensure that I catch their coin fever. They also want me to see, and feel, the difference between the sunken, incused surface of a 1909 $5 Indian Head gold piece and the raised surface of a 1907 gold Double Eagle, a unique pattern coin. I’m pretty sure the Double Eagle would be worth millions if it ever came up at auction, but Doty casually describes as a “high-relief failure.” My hands shake a bit, but my hosts are too polite to notice. Next up is Bill Yeingst, Chair of the Smithsonian’s Division of Home and Community Life. It’s Yeingst’s job to recognize that a 1960s lunch counter from Greensboro, North Carolina is a fine example of mid-century chrome, vinyl, and linoleum design, as well as a snapshot of Woolworth lunch counters in countless American cities and towns. But for Yeingst, this counter is mostly important as piece of Civil Rights history. 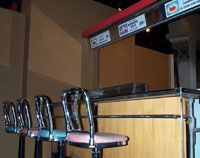 It was at this counter, in 1960, that four African American students were denied service due to the color of their skin. A sit-in ensued, followed by marches, protests, and a boycott of the store. Within six months the Woolworth lunch counter in Greensboro had been desegregated. Not all of Yeingst’s social-history interests are so politically charged. For example, a few years back Yeingst traveled to Oregon to meet with the late Ken Kesey about bringing the author’s famous psychedelically painted “Further” bus from the 1960s into the Smithsonian fold. To hear a recent Wikipedia entry tell it, Kesey refused to sell or donate the bus to the Smithsonian, but for Yeingst the problem was simply one of space. Where would they put a 38-foot-long school bus? A section of the Woolworth lunch counter where, in 1960, Civil Rights history was made. As if to illustrate his point, Yeingst invites me to take a stroll with him down into the Smithsonian’s fabled basement, where the treasures of America’s Attic, as the institution is sometimes called, are really kept. The scene is not quite like the final shot in Raiders of the Lost Ark, but close. Stretching from wall to wall, floor almost to ceiling, are rows upon rows of furniture and objects, packed eight-deep in places. There are bentwood chairs, trunks and chests, high cases, dressers, desks, dollhouses, lamps, prams, and on and on and on. In one storage room, Yeingst hands me a flashlight since the light from the overheads is obscured in places by the sheer volume of stuff. He points out a number of beautiful marquetry tables from the mid-19th century by Peter Glass, a furniture maker who lived in Scott, Wisconsin. He shows me a patent model submitted by J.T. Grimes in 1848, just one of the Smithsonian’s collection of 20,000 or so patent models. And high up on another shelf are a mismatched pair of George Nakashima chairs, which were purchased by the Smithsonian in the 1960s for public seating but are now part of guess-who’s collection. The reason for the mismatch? The Smithsonian only keeps one example of each object in its vast collection. Otherwise, I suppose, the things might breed. As I say goodbye to Yeingst and head into the “Stories on Money” exhibit (which is fantastic, by the way), I can’t help but think of the tricky tightrope these Smithsonian curators must have to walk, balancing their personal passions and professional interests with the needs and limits of their institution. In the end, I think we are all pretty darned lucky to have such thoughtful stewards of our national heritage. My strong sense is that the stewards feel pretty darned lucky, too. I have several antique radios that my husband collected over the years. I would like to consider donating them to the Smithsonian. I believe most are from the early 30’s and 40’s. Five are the tall models, one is a record player and radio combo, another is a end table with a radio inside. I hope they can be of use. Thank you.